Lots happened this weekend. Let’s recap. 1. My in-laws were in town this weekend. We had a good time, and I hope they enjoyed themselves. (I think they did.) We hit up the Apple Festival on Saturday, and then enjoyed dinner at home. I made a blueberry cobbler (I followed the directions this time!) and we invited neighbors over for dessert. There was no cobbler left after Saturday night, so I think it was a hit. 2. After driving around downtown and the Grove Park Inn area, my husband and I found ourselves alone. We decided to check out LAAFF (another festival) for a little while. We ran into a lot of people. 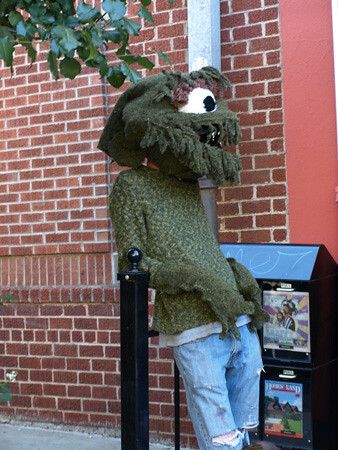 And even spotted Oscar on the streets of Asheville. I have so many pictures from Sunday, that it’s going to entail another blog post. 3. I finally finished my exam for my online course. I’m done. That makes me so, so happy. 4. Chloe’s been enjoying a new empty box since last night. Crazy cat. She’d rather sleep in a box than in her beds. 5. My uncle (and almost-21-year-old cousin) are in town for my grandpa’s 80th birthday. It’s been fun getting to know my cousin, since I last saw him roughly 15 years ago. It’s been a while. 6. My brother is in China. How crazy is that? 7. It’s Labor Day. I loved that we had our windows open, and the flag out. Loved it. 8. I also loved that 90210 was on SOAPnet all afternoon. Don’t think I didn’t lay on my couch, work on my class and catch up with the Brenda-Dylan-Kelly drama. 9. I’m so not ready to go back to work tomorrow. Sounds like a full weekend with lots of fun. And I’m jealous of your awesome 12 miles. My 12 miles sucked horribly, but I did it. And my town? Not so much full of runners. I’ve had many people comment that they saw me out running, but I never see anyone else running around town.